Windows ad mediation capabilities are initially launching for Windows Phone 8.0, 8.1 Silverlight and 8.1 XAML. Currently you can use Microsoft Advertising, AdDuplex, Inneractive, Smaato, AdMob, InMobi and MobFox with Ad Mediation. You will need to set up an account on each of the ad providers that you plan to use and create an ad unit in it. Here are the steps to use Ad Mediation in your Windows Phone 8 app. Before you can use Ad Mediator in your apps, you need to download and install Ad Mediator Extension. The Ad Mediation control will appear in the toolbox next time you open Visual Studio. The Name element will help you to identify the specific control in your app when you configure your ad mediation. You can change this to whatever you’d like, but be sure not to change or duplicate the Id element. This Id must be unique for each control within your app. Once you’ve added all the controls you’d like, you’re ready to configure them through Connected Services. Note that if you add an additional AdMediatorControl later, you’ll need to configure it through Connected Services again. Otherwise, the new control will not be able to use ad mediation. To configure the controls, right-click the name of the project in Solution Explorer, click Add, and then click Connected Service… to launch the Services Manager window. By default, the Microsoft Advertising DLLs will be added, and Microsoft Advertising will be enabled. If you don’t want to use this ad network, you can remove it in the next step. For each of the selected ad networks, click on configure hyperlink to set the ad unit id for that ad provider. Even if you don’t configure the Ad Controls in the app, it can be done in the Windows Phone Developer Portal without needing to update the app again. To add and remove ad networks, click Select ad networks. You’ll see a list of all the ad networks that are supported for your project. Check the boxes of the ad networks you want to use. After you’ve selected your ad networks, click OK. The control will attempt to retrieve the DLLs for each ad network. You’ll see the progress and result of this process. Click OK, and you’ll be able to see which DLLs were successfully fetched. Note: In some cases, you may see that certain DLLs were not fetched (for example AdMob as it is not available on Nuget). In this case, you’ll need to add them manually. For links to download individual assemblies, see Selecting and managing your ad networks. If you decide to add another ad network after doing this configuration, you’ll need to open the Services Manager window again, select the network, and ensure the DLLs are added. Each ad network may require certain app capabilities. These are shown by each provider in the Services Manager window. Be sure to declare all of the required capabilities in your app’s manifest so that the ads are properly displayed. 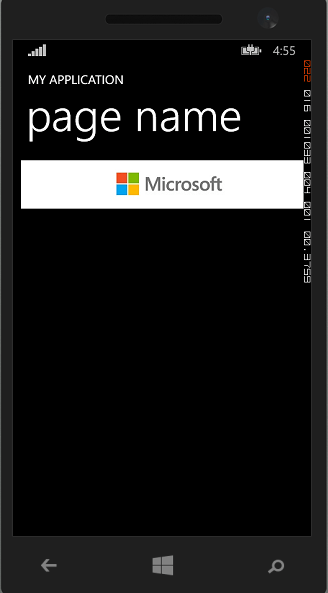 Running your app in the Windows Phone Emulator is a good first step. When you do so, test metadata will be used, so you can test your app and make sure it’s coded correctly before you’ve even entered your ad network required parameters. When you run your app in the emulator, the ad networks will rotate in sequential order, with one network displayed after another for equal amounts of time. Be sure to wait long enough to run through a few cycles so you can view all ad networks and reduce the chance of any temporary connectivity issues which may occur. Test ads will be displayed (for ad networks which support them). Once you’ve built your app to include all of the ad networks you may want to use, and tested it to ensure everything’s working, you’re ready to submit the app. During the submission process, you can configure the ad mediation behavior you’d like to see. You’ll be able to adjust this later without having to make code changes or submit new packages. When you upload your packages, Dev Center automatically detects that you’re using ad mediation and identifies which ad networks you’re using. On the package upload page, you’ll see an Ad mediation configuration section. This is where you’ll configure your mediation logic. The first time you submit your app, you’ll create a baseline configuration. After that’s set up, you can add market-specific configurations to take advantage of specific ad networks’ strengths in different markets. If you want to adjust your ad mediation for a specific app, you can do so at any time without having to resubmit the app. This is useful if you’ve already added ad networks into your app that you hadn’t previously set up accounts for, or if you’re finding that one ad network is not able to fill ads reliably in specific markets. To make changes, view the app details page in Dev Center and click Ad mediation. You can make changes to your baseline configuration as well as to market-specific configurations. You can also add or remove market-specific configurations if desired. You can download the project source code and use it as an reference. AdDuplex is a cross-promotion network specifically targeted at Windows 8 and Windows Phone apps and games. You add our AdControl to your application and start serving ads for other apps. They serve ads for your app in return. The ratio is 8:10. This means for each 10 ads displayed in your app 8 of your ads will be displayed in other apps. The remaining 2 ads will be sold to support the service. The advantage of using adduplex is that it has a 100% fill rate. So it is often used as a secondary option to fill ad space if the primary ad network fails to deliver an ad. Here’s how you could use AdDuplex in your app. Click on New App button in the dashboard to register a new app. We are building a Windows Phone 8 Silverlight application. Choose a Blank Windows Phone Silverlight template from installed templates and create a project. Now add the adcontrol in your page. Use the App id which you generated earlier. You can preview your own exchange ad by setting IsTest property to true. Make sure the whole AdControl is visible by verifying that it’s not obstructed by any other objects on your page. Recently lots of developers are seen facing problems with pubcenter ads. The impressions are at an all-time low still for some developers ads never show up (not even the test ads). There’s a little thing that developers should be mindful of and pubcenter will again start working for them. Heres a tutorial explaining how you could integrate pubcenter advertisements in your Windows Phone 8 apps. Note down the application ID and the ad unit ID which you just created. Right click on the name of the project in solution explorer and choose Add>Reference. From the dialog box that appears choose Microsoft.Advertising.Mobile.UI and Microsoft.Advertising.Mobile and add it to your project. These references will enable you to use Microsoft’s pubcenter ads in your app. Instead of adding the reference you could have dragged and dropped the AdControl from Toolbox. Not adding all the required capabilities is main reason behind ads not showing up from pubcenter. Not choosing the right capabilities doesn’t lead to a syntax error and no error is reported while deploying the app. The following ID_CAP capabilities must be included in the manifest of the advertising-enabled app. Go to Solution Explorer> Properties> WMAPPManifest.xml and move over to capabilities tab. From there choose the following capabilities. You may require other capabilities based on the type of application you are building but these will be required for pubcenter. Add the following reference to the page where you wish to display ads from pubcenter. Add the AdControl to your page and insert the app id and ad unit id in it. If you are unsure where to put the code then have a look at the screen shot below. Also notice that the app id and ad unit id are set to test_client and Image480_80 respectively which is the default value. Also we have added an error occurred event handler. You could use this event handler while debugging to know the reason for ads not appearing in the app. Most of the times if the ad control is correctly configured the reason for ads not appearing is low fill rates. Also you could use this event handler to load ads from another provider if ads from pubcenter fails. The code snippet show how you could add Google Admob’s ads when pubcenter fails to get an ad. 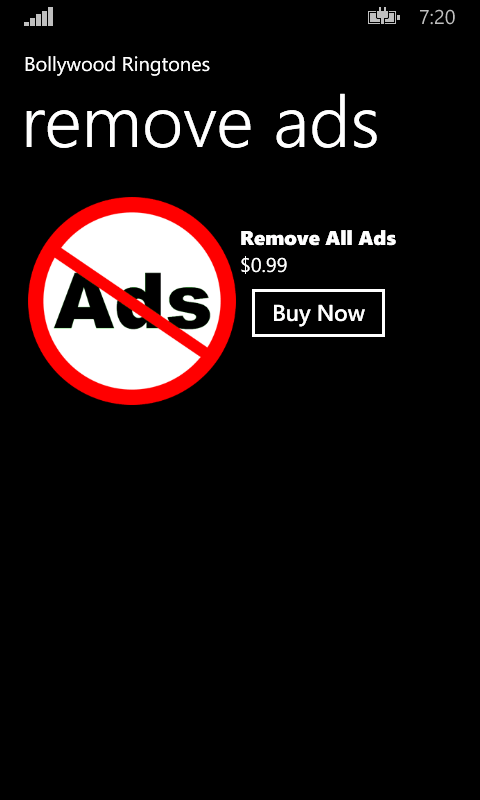 Here’s an article explaining how you could add Google AdMob in your Windows Phone 8 app. A few users have claimed that they can’t find this event trigger in their ad control. They might not be using the latest Ad SDK. When you run the app in the emulator ads should now appear. Here’s a screenshot of the sample app i built. If you haven’t added in app ads in your app then you could follow this tutorial to add Google Admob in your app. Define a public class AppSettings which is global to the whole project with two public data variables DISPLAYADS and ISADBLOCKERACTIVE. You can define a public class by placing it just below the namespace of the project. 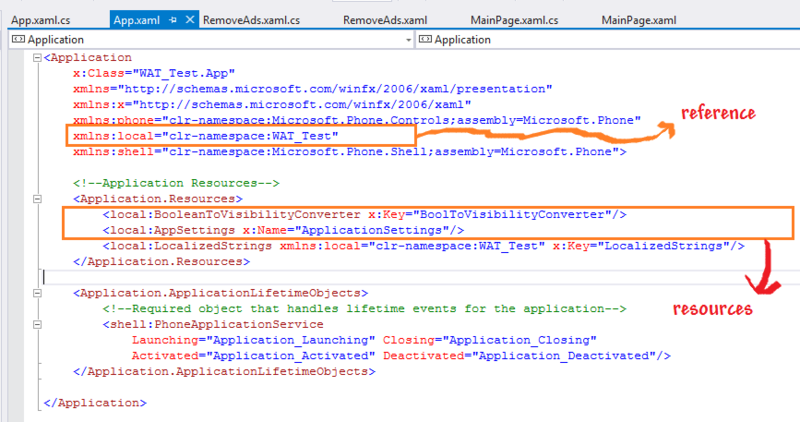 In the sample provided I have defined it in App.xaml.cs just below the namespace of my project WAT_Test. We will update the values of these variables when the app is launched and check whether the user has purchased the IAP to remove ads. If he has purchased it then ISADBLOCKERACTIVE will be set to true and DISPLAYADS will be set to false. When I discussed how to use google admob in an app, I showed that it can be done through XAML or using C# code. So here too I will discuss how to block ads when it has been placed using XAML or via C#. Add a value converter class in App.xaml.cs named BooleanToVisibilityConvertor. This class implements IValueConverter converts a boolean value to an equivalent visibility and vice-versa. This is much simpler and you just need to check whether DISPLAYADS is true or false before calling admob() function. These screen shots show that earlier ads were being displayed in the app but after IAP they didn’t appear. Be assured it wasn’t coincidence as I have getting 100% fill rate for Google Admob for the past few days. This topic describes how to implement a trial experience in your Windows Phone app. The purpose of a trial experience is to give the user an opportunity to try your app before they commit to buying it. In a trial experience, you typically offer a limited version of your app, for example, by disabling features, by disabling levels in a game, or by setting a time limit on using the app. The limitation you choose for your app is entirely up to you. I will be demonstrating this with the help of an example. Suppose there are two pages in an application out of which only one can be opened in trial version that is first page . In full version of the application you can open both the pages that is first page and second page. 1. First create a blank project and name it Trialapp. 3. In the App class, declare the following local static variable. The LicenseInformation class enables an app to determine if it is running under a trial license. 4. In the same App class in App.xaml.cs, add the following read-only property and local variable. This property is used to cache the license information while the app is running. The app uses the property whenever the current license information needs to be checked. 5.In the following sections, the license information will be checked in the Application_Launching and Application_Activated event handlers. Since this logic is used in two locations, we wrap it for convenience into its own method. In the App class located in App.xaml.cs, add the following method. 6. Then open the MainPage.xaml and remove the XAML code for the Grid named LayoutRoot and replace it with the following code. 7. Then add two more pages to the application and name it Firstpage.xaml and Secondpage.xaml. 8. Open the Page Firstpage.xaml and change the application name to trial app and page name to first page. Similarly do it for Secondpage.xaml and change the page name to Second page. 9. In the MainPage.xaml.cs code-behind file, add the following methods. 10. Now run the application in debug state you will see that the app runs in trial mode as the value of _isTrial in App.xaml.cs is true. The following screen will appear before you and the second button will be disabled. 11. Now when you will change the value of _isTrial to false the app will run as full version. 12. While submitting the app to store you need to tick the checkbox of trial functionality in your app. You can do this easily. Go to your dashboard. Select your app. Go to the app info page and check the checkbox. Note: If you forget to check this checkbox you app will be available in full version to all the users in the marketplace. 13. You can download the Project zip file from the link given below. In app purchases is an excellent way to increase your revenues from your Windows Phone app. It lets you distribute your app for free and then charge the users for some added features or service. I will show you how you can easily add it in your app. You would need an active Windows Phone developer account for this tutorial as even for testing purposes you need to create a product for your app. Go to App Info and fill in the details. Reserve your app’s name and choose its category. Go down to More Options and choose distribution channel as Beta. Add the live account email ids of your beta testers. Browse and upload the XAP package for the project that you compiled earlier. You will need to fill in all the mandatory fields and upload the app icon and screenshot too. Submit the app and go to App details page and note down the App ID from there. Products can be of two types, consumable and durable. Consumable products need to be re-bought once used where as durable products need to bought only once. Fill in the details of your product and save it. Add title, description and product icon. We have successfully created a beta app and have also added an in app product for it. Now we need to move to the coding part. The file in_app_purchase.xaml shows the XAML that could be used to list the in app products. Copy and paste in in the ControlPanel of your app. Lastly place the code in in_app_purchase.cs in MainPage.cs which will populate the products for the current app. Step 5. Buy an Item ButtonBuyNow_Clicked is the event handler on click of Buy now button. It takes the user to his wallet where he can purchase the product. The screenshot shows the product listed in the app. When it comes to monetization using in-app advertisements in Windows Phone apps, there are quite a few option like Microsoft’s Pubcenter, Mobfox, Smaato, AdDuplex, Nokia’s Inneractive and Google’s Admob. In the past two years I have tried all these ad providers and have finally struck to Google’s Admob. There was a period when Microsoft’s Pubcenter gave the best returns but gradually its fill rates started dropping and earnings dropped by around 99.5% for developers outside US. That made me try other ad providers available for WP and frankly none of them are as good as Pubcenter(the old one) but now developers don’t have a choice. In this post I will show you how you can integrate AdMob in your Windows Phone app. You can add AdMob in your app by XAML or via code in C#. We have noticed a improved eCPM(0.2 $ to 1.1$) and fill rates(60% to 90%) for pubcenter. So you might consider using pubcenter in your windows phone app. If you have significant traffic in India then you can give a try to Vserv for Windows Phone 8 which gives a better eCPM than AdMob. Note: You would need a upgraded Admob account for this purpose and the previous admob account is no longer supported. You can read more about it here. You can configure analytics for your app and link it to your Google analytics account. Learn how to integrate Google analytics in your app. We will skip it for now. Click on save and an AdUnit id would be generated. All done you are ready setting thing up for AdMob. Unzip the SDK files and you will find a GoogleAds.dll file in it. Create a new project and add a reference to this dll file in your project. Here’s an article explaining how to integrate a Toolkit or Third party SDK with windows phone app using NuGet Package Manager. IMPORTANT: You will need to add the following capabilities in your app for ads to appear! ID_CAP_NETWORKING: Access to network services is required when requesting ads. ID_CAP_WEBBROWSERCOMPONENT: Required since the AdView is a web browser. ID_CAP_MEDIALIB_PLAYBACK: Provides access for currently playing media items. ID_CAP_MEDIALIB_AUDIO: Provides read access to audio items in media library. Go to Toolbox in your Visual Studio and right click on general category and select Choose Items. From the choose items dialog box tick AdView from Google Ads and click OK to include the control in the Toolbox. Add the AdUnit ID you generated earlier to the control. The XAML should now look similar to this. If you have added the XAML code directly then a reference will be required for AdView control xmlns:GoogleAds="clr-namespace:GoogleAds;assembly=GoogleAds"
You can see the function admob(StackPanel stck ) takes a parameter which is the name of the stackpanel in which you wish to place your ad. Instead of a stackpanel you could use a Grid too. Here is how the app looks when you run it in the emulator.